Dr Peter Garrard from St George’s, University of London presented two posters on the iASiS project at the Alzheimer’s Association International Conference 2018 (AAIC 18). The posters showed pilot data on linguistic indicators for prediction of early Alzheimer’s Dementia. 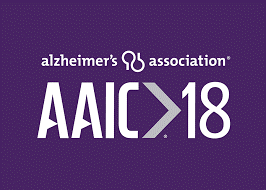 AAIC 18 took place on 22-26 July in Chicago, USA receiving over 5,000 attendees from 68 different countries, convening basic scientists, clinical researchers, clinicians and the care research community to discuss advances in dementia science.